Vallecular cyst: A 60 year old gentleman who was a known case of liver cirrhosis and thrombocytopenia presented to the OPD with complaints of dysphagia and foreign body sensation in the throat. He was diagnosed to have a large vallecular cyst. He required multidisciplinary care. Platelet transfusions were administered peri-operatively according to guidelines. An elective tracheostomy was performed. Cyst was excised by LASER. At the time of discharge patient was decanulated with excellent speech swallow outcomes. Multinodular goitre: A middle aged female underwent total thyroidectomy for a large multinodular goitre, largest dimension 12 cm. She had comorbidities of obesity poorly controlled diabetes and hypertension. She recovered well with no requirement of calcium supplements and good voice. Oral cancer: A 42 year old gentleman was diagnosed with T4bN1M0 buccal mucosa cancer. There was disease extension into the masticator space. A thorough infra-temporal fossa clearance along with bite composite resection was performed. Angiofibromas: Two very challenging and extensive stage III angiofibromas were performed endoscopically. One of them underwent ore-operative embolisation and the other underwent an elective intra-operative external carotid ligation. None of them required conversion to open approach. Both patients were discharged on the third post-operative day. Schwanomma : A young male presented with a left cervical schwanomma abutting great vessels with approximately 180 degree encasement. The surgery was successfully performed without any major blood loss or vessel or nerve damage. Patient has slight hoarseness of voice but is recovering well. Carotid body tumour: A middle aged female presented with Right carotid body tumour extending superiorly up to the jugular foremen encasing the carotid -270 degree and engulfing all major nerves. Mass was excised uneventfully without any great vessel compromise. Patient is recovering well. Parotid cancer- Adenoid cystic carcinoma parotid was operated for total parotidectomy with modified radical neck dissection. Patient did not suffer any facial weakness. He is now awaiting adjuvant treatment and healing well. 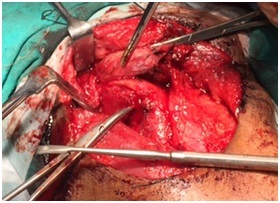 Thoracic mass- A large retrosternal goitre was operated at PK Deshpande hospital. The swelling was reaching up to the arch of aorta and brachiocephalic vein causally. We could approach the entire swelling trans cervical without need for sternotomy. Patient has both vocal cords functioning and no hypocalcemia post-op. Cochlear Implant: In a first ever in Neeti Clinics, 3 Cochlear Implant surgeries were done back to back. Dr Harsh Gupta and Dr Gauri Kapre Vaidya were the operating surgeons under the mentor ship of Dr Kirtane. One of these patients was a post-lingual hearing challenged adult. Switch ons were performed for all three patients with satisfactory results. Unknown primary: An elderly female presented with large lateral nodal mass. It was diagnosed unknown primary. Modified radical neck dissection was performed preserving all important structures and no functional morbidity. It was a poorly differentiated/ anaplastic tumour. IHC is being processed for same. Trismus surgery: A young adult male underwent Trismus Release Surgery. He had travelled all the way from Gujarat to undergo surgery here. Two surgeons had also specially traveled from Gujarat to witness the surgery and learn the technique. Total Thyroidectomy with central compartment clearance:-A young unmarried female underwent total Thyroidectomy with central compartment clearance for proven papillary carcinoma thyroid.She had good voice and serum calcium postoperatively. Total Type 3 Cordectomy: Trans muscular cordectomy was performed by laser for a mid vocal cord mass.Patient had satisfactory voice post op. Kartagener’s Syndrome with Sickle Cell Trait – A young lady with Kartagener’s syndrome was operated for Functional Endoscopic Sinus Surgery (FESS). In Kartagener’s Syndrome patients have Dextrocardia, Situs Inversus and Mucociliary dysfunction. Patients suffer from Bronchieactasis, repeated chest infections. In this case additional challenge was the patient being sickle cell positive. Pre operatively patient was prepared with antibiotics, decongestants and chest physiotherapy for the Kartagener’s syndrome. She was given Folic acid, Steroids and Sodamint tablets for her sickle cell trait. During surgery due care was taken to maintain oxygenation, good hydration and to avoid hypothermia. With all the necessary precautions the surgery and post of recovery of the patient was uneventful. 1.Cochlear Implant: A 7 year old child who was already an implantee on one side underwent cochlear implant surgery for the opposite ear. Surgery was performed very smoothly by Dr Harsh Karan Gupta under the guidance of Dr Kirtane sir. 2.Tracheal Resection and end-to-end Anastomoses: Two patients of tracheal Resection with end to end Anastomoses were assessed by follow up endoscopic assessment. A young 28year old boy could be successfully decannulated. A middle aged lady with multiple comorbidities was shifted to T-tube. She was breathing and phonating well on discharge. 3.Substernal goitre: A Large Mutlinodular 14 x10cm in dimensions with retrosternal extension was operated by cervical approach. He had normal vocal cord functioning and was normocalcaemic in post-op period. Cricotracheal Resection + Thyrotracheal AnastomosisFollowing organophosphorous poisoning a 26 yr male patient had post intubation tracheal stenosis. The stenotic segment was 3 cm in length extending from C5-C7 level causing near complete luminal narrowing. The stenotic segment was excised and anastomosis achieved between lower end of thyroid cartilage and 4th tracheal ring. Sub glottis Foreign Body A 4 yr old girl presented with 6 months history of sudden onset hoarseness of voice and difficulty in breathing. Hopkins rod examination in OPD revealed papillomatous growth in Larynx and provisional diagnosis of juvenile recurrent Laryngeal papillomatosis was made. She was posted for Co2 LASER vapourisation of the papillomas. However CT scan revealed a foreign body vertically placed in the tracheal in subglottic region. The child was referred to pediatric surgeon Dr. Rajendra Saoji. Following morning the patient developed respiratory arrest and emergency tracheostomy had to be performed. Dr. Saoji did direct laryngoscopy under general Anaesthesia and attempted to remove the foreign body endoscopically but could not dislodge it .Open surgery was planned for a later date. On that day under anesthesia, direct laryngoscopy was done to begin with. Surprisingly no foreign body was seen. The only explanation possible was that during attempt at endoscopic removal the foreign body might have been slightly dislodged and later coughed out by the child. She was later decannulated uneventfully. Endoscopic CSF leak repair: A 42 yrs old female patient presented with CSF leak leading to watery discharge from the nose. The leak was from right cribriform plate. Endoscopic repair was done with fascia lata and medical glue. Glomus Tympanicum A 45 yrs old female patient was operated for right ear by Dr. R. B. Deshmukh , Dr. Abhishek Vaidya and Dr. Prashant Naik by post aural approach. Near complete excision was achieved with minimal blood loss.The patient was morbidly obese with diabetes and hypertens which posed anaesthesia related high risk issues. The surgery lasted 6 hours and the patient was discharged the next day. Tracheal Granulations- A middle aged female had post extubation breathing difficulty. She had granulations polypoidal lesions in her trachea above the level of carina. These were successfully removed by joint team work of Dr. Rajendra Saoji, Dr. Vikrant Deshmukh. Anaesthesia management was very critical in this case where intubating bronchoscope along with intermittent apnea technique was used. Dr. Vidula Kapre & Dr. Latika Panpaliya approved anaesthesia team. Base of Tongue- A 74 year old gentleman had base of tongue cancer with bilateral cervical nodal metastases. The base of tongue lesion was removed with safe margins using LASER. He also underwent bilateral modified radical neck dissections. His wound healing is now satisfactory. Carotid Body - A young gentleman had right sided carotid body tumor Shamblin’s type II with >1800 encasement & indentation of internal carotid artery. 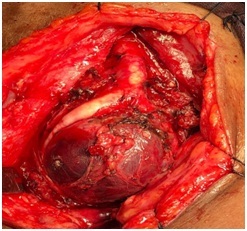 The entire tumor was excised with minimal bleeding. His post operative recovery was satisfactory. 4.CSF leak- A middle aged lady suffering from diabetes & hypertension had CSF rhinorrhoea on the right side. She had flown down from Pakistan for her surgery- endoscopic repair of CSF Leak. 5.Choanal Atresia - A young 16 year old girl was suffering from recurrent mucoperulent discharge from right nostril. Nasal endoscopy revealed & complete blockage of post nasal passage on that side. Endoscopic removal of body & mucosal blockage was performed. 6.Thyroid – We had 19 thyroid surgeries within a single month at Neeti Clinics. Angiofibroma-A stage III Angiofibroma was operated via endoscopic approach. Patient was non-affording for embolization so the external carotid artery was ligated before the start of excision. Patient was consented for sos conversion to open approach. However, it was successfully completed in toto through endoscopic approach. Patient recovered well and went home after pack removal on the fifth day. Juvenile laryngeal papillomatosis- A young child has been under our treatment in the past 1 year for papillomatosis. He has undergone 22 surgical procedures so far. He unfortunately has tracheobronchial type of papillomas which is the most difficult to cure completely and takes the longest to decannulate. Spectrum of cases- We operated 9 thyroids, 3 parotids and 1 parathyroid.The thyroids were ranging from a large multinodular goiter with retrosternal extensionto a hemithyroidectomy for a small 2cm unilateral solitary thyroid nodule.All three parotid surgeries were superficial parotidectomies, one of which was a revision surgery for three times recurrent pleomorphic adenoma. None of the patients had a facial nerve injury.Parathyroid adenoma was operated at Trinity hospital with the aid of intra-operative PTH monitoring. The 20 minutes post excision reading was nearly less than 1/10th pre-operative values. Awake oral intubation- A young adult patient had been operated for ca buccal mucosa elsewhere and had already received Radiotherapy. He was posted for excision of recurrence in parotid lymph nodes Apart from difficulties posed by previous surgery and RT, patient had an anatomically difficult airway.Awake intubation was planned for this patient since the surgery involved maxilla, nasal intubation was not possible.The airway was anaesthetized and decongested with xylocaine adrenaline nasal pack, alongwith 4% xylocaine nebulization and superior laryngeal nerve blocks. In addition, spray as you go technique was employed to anaesthetize the larynx. Laryngoscopy provided minimal view of larynx. FROVA was introduced, its position in trachea confirmed by ETC02 and oral endotracheal intubation performed over the FROVA. Non-recurrent laryngeal nerve: This is a condition that is extremely rare 0.2% of all thyroid surgeries. We saw two back to back cases of this condition during total thyroidectomies. The surgical skill lies in identifying and preserving these atypical nerves to avoid post-operative nerve weakness and voice changes. 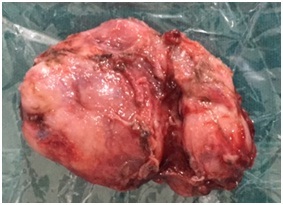 3.Thyroid micro-carcinoma: A middle-aged gentleman was suffering from ca buccal mucosa and was operated for wide excision with neck dissection. His final histopathology revealed metastases from thyroid cancer in the cervical lymph nodes. Several months later, we could convince him for thyroid surgery and completion neck dissection. It was a difficult operation because of post-op fibrosis and chyle leak changes from previous surgery. 4.Parathyroid adenoma: A middle aged lady had complaints of bony pains was diagnosed to have parathyroid adenoma. Her pre-op PTH was 269ng/ml. Intra-op washings from excised specimen was >2000. Post-excision 20 minutes Sr. PTH was 29ng/ml. She is recovering well. Endoscopic Repair of CSF Leak: A young male patient had CSF leak from his nose. Endoscopically the leak was identified in ethmoid area and repaired with fascia from thigh and medical glue. Tracheal Diverticulum : A young male patient having tracheal diverticulum was operated successfully. Eminectomy: A patient operated for Trismus; subsequently had dislocation of temporomandibular joint, hence could not close his mouth. He had to undergo another surgery where TMJ was approached externally and condylar eminence excised on both sides. Intraoral occlusion achieved and opening and closing of jaw obtained. Free Radial Artery Fore Arm Flap: was used in a patient to reconstruct buccal mucosa defect after excision of oral cancer. Augmentation Pharyngoplasty: Post Laryngectomy, a patient developed stricture and had dysphagia. Augmentation pharyngoplasty was done using patch PMMC. Total Thyroidectomy in a male patient with cardiac disease: A male patient with ischemic heart disease had very low ejection fraction. He was operated successfully at American Oncology Institute. Deep Vein Thrombosis with IVC Filter: An elderly patient was to be operated for Ca Buccal Mucosa. He had history of Deep Vein Thrombosis with filter placed in Inferior Vena Cava. The patient was on warfarin which was withheld two days prior to surgery and patient put on Inj Heparin.All pharmacologic and non pharmacologic thromboprophylactic measures were taken. Patient underwent surgery and had uneventful post op recovery. Juvenile Laryngeal Papilloma: A 2 year child was referred from Govt. Medical College Nagpur for CO2 LASER excision of Juvenile Recurrent Papillomatosis. Induction of anaesthesia was challenging due to the possibility of papillomas obstructing the airway. Cervical Epidural Anaesthesia: During Annual Thyroid Surgical Workshop 6 patients were operated under cervical Epidural Anaesthesia successfully. One was for Hemithyroidectomy and 5 for Total Thyroidectomy. 3 Surgeries lasted more than 3 hrs. Endoscopic Repair of CSF Leak: In case of injury , the thin bone separating nasal cavity and skull, can get fractured. Cerebrospinal fluid begins to leak continuously from the nasal cavity. This defect was repaired endoscopically using tissue from the thigh and medical glue .Two such surgeries were performed during November & December . Free Radial Artery Fore arm Flap: An old operated case of Ca mandible was disease free for several years and wanted to undergo plastic surgery to get rid of facial scar of PMMC. Free Radial Artery Fore arm Flap was done by a surgeon who came from Bangalore for the surgery. Free Fibula Micro Vascular Flap: was performed to cover defect after excision of Carcinoma Mandibular Arch. Cochlear Implant Surgery: 7 Year girl had been operated for cochlear implant .5 year back by Dr. Gauri Kapre Vaidya . Patient has been doing very well and the family wanted implant surgery for the second ear as well . Dr. Harsh Karan Gupta performed the surgery. Awake Blind Nasal Intubation: A young 32 year male patient had zero mouth opening due to trismus because of oral submucous fibrosis caused by chewing tobacco .Administering anesthesia in such cases is difficult as there is no access to the airway with the help of local anaesthesia and sedation .Awake Blind Nasal Intubation was performed and then patient was administered anaesthesia for the surgery. After the surgery the patient had wide mouth opening of 3 cm. Free Radial Artery Forearm Flap: Free Radial Artery Forearm Flap was done to reconstruct defect after excision for Ca Alveolus. MicroLaryngeal LASER Surgery in an Obese Patient with Obstructive Sleep Apnea Syndrome : A middle aged obese patient with Obstructive Sleep Apnea Syndrome was posted for MicroLaryngeal LASER Surgery. Anesthesia in such patients is challenging. During induction patient can have airway obstruction. For LASER surgery patient is intubated with small sized Endotracheal Tube. In an obese patient, ventilation with small size tube can lead to high airway pressures, inadequate ventilation of some regions of the lung and ventilation perfusion mismatch. After reversal of anesthesia obese patients tend to hypoventilate and recovery from anesthesia may be delayed. With careful titration of anesthesia doses, patient had smooth anesthesia course and good recovery. Cochlear Implant Surgeries -Two Cochlear Implant Surgeries on boys age 2 yr and 5 yr were conducted by Dr. Milind Kirtane. Dr. Harsh and Dr. Gauri assisted Dr. Kirtane during the surgeries. Juvenile Recurrent Laryngeal Papillomas – Two boys age 4 yr and 7 yr are chronic patients of JRLP. They are undergoing multiple settings of CO2LASER excision of the papillomas. Endoscopic CSF Leak Repair – was done on a young lady. Free Fibula micro vascular Flap was performed after excision of cancer mandible in a young male patient. A girl with tracheal stenosis underwent cricotracheal resection anastomosis for reconstruction of the airway, Check endoscopy 3 weeks later showed good patient airway. Repeat endoscopy 1 month later showed adequate airway patency. 1 week after endoscopy patient was decannulated successfully. End to End Tracheal Resection Anastamosis An adult lady had undergone tracheoplasty elsewhere. Montgomery’s T tube had been inserted, but the procedure was not successful. At our clinic we attempted tracheal dilatation on 3-4 occasions but patient continued to have distress. Hence End to End Tracheal Resection Anastamosis done. Tracheostomy tube was removed on 4th day of surgery. Patient was comfortable and discharged 1 week post op. A girl with tracheal stenosis underwent cricotracheal resection anastomosis for reconstruction of the airway, Check endoscopy 3 weeks later showed good patient airway. An adult lady with papillomas underwent laser excision. Due to the multiple previous surgeries (some of them with cold steel at another centre) she had developed a glottic web which was causing her respiratory distress. The web was laserized & good airway achieved. An elderly lady having facial palsy due to mastoiditis was operated upon by mastoidectomy. Post surgery her facial palsy recovered completely. Trans nasal endoscopic pituitary macroadenoma excision done at CIIMS with neurosurgeon Dr. Pankaj Sarda. Tracheal Stenosis: A young lady was operated elsewhere for tracheal stenosis. Montgomery T tube was inserted. 6 weeks after the surgery the T tube was removed but patient had to be tracheostomised as she had respiratory distress. She is now undergoing CO2 LASER vaporization of stricture and tracheal dilatation. Endoscopic CSF leak repair: was done in a young female patient. Juvenile Recurrent papillomatasis: A 3 year old girl was totally aphonic due to laryngeal papillomas. Cautious spontaneous inhalational induction was done and papillomas excised with CO2 LASER. Free Fibula Micro Vascular Flap: was done for Mandibular defect after excision of alveolar cancer. Post Tonsillectomy Secondary Hemorrhage: Post tonsillectomy a young boy had secondary hemorrhage due to infection. Coagulation profile was normal. 3rd generation IV antibiotics were given. He had two episodes of massive bleeding every 3rd day. On examination under general anaesthesia no specific bleeder was found in tonsillar bed. Angiography was also done but no specific bleeding vessel or aneurysm was located. Finally the bleeding was controlled spontaneously after 10 days. Chronic Kidney Disease with Oral Cancer: A middle aged adult male was operated for oral cancer. He had chronic kidney disease with high levels of blood urea, serum creatinive and potassium. All precautions were taken to avoid any nephrotoxic drugs, use relaxants not dependent on kidneys clearance and to maintain renal perfusion. Patient had uneventful recovery after 7 hrs surgery. Glomus tympanicum: A patient having a co -existing cholesteatoma along with a glomus tympanicum in right ear was operated .The glomus tumor was very large and had feeders from ICA which made surgical challenging. Awake Blind Nasal Intubation- was done for a patient with zero mouth opening, posted for surgery of trismus. UvuloPalato Pharyngo Plasty- Adult male patient with obstructive Sleep Apnea Syndrome was posted for LASER assisted . UvuloPalato Pharyngo Plasty. He had a difficult airway with Mallampatti Grade IV short mandible and large tongue. Awake nasal intubation was performed. Decanulation of tracheal stenosis: Young female patient suffering from tracheal stenosis for more than 1 year was successfully decannulated. Subglottic Web- A 2 &frac12; year old female child was referred for CO2 LASER excision of subglottic web . She had undergone long term intubation and ventilation leading to the formation of web. Effective subglottic diameter was only 2.4 mm. Patient was intubated with a 2.5 mm tube and LASER vaporization of the web was done. 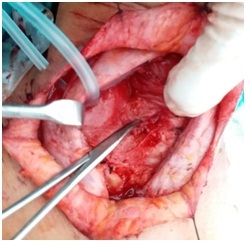 Free Antero Lateral Thigh Flap was done for closure of defect after excision of oral malignancy. Juvenile Recurrent Laryngeal Papillomatious – 10 year old boy has been undergoing repeated CO2 LASER excision of papillomas. Now the papillomas are fairly under control. Temporal Bone Resection: We achieved a land mark by performing a Temporal Bone Resection with Pinna resection with Total Parotidectomy and PMMC Flap. This is a very rare surgery and performed in our clinic for the 1st time in Vidarbha. 1. Juvenile Recurrent Laryngeal Paillomatosis- A 4 year old boy is undergoing multiple procedures for CO 2 LASER vaporization of recurrent Laryngeal Papillomas. 2. Total Thyroidectomy in a patient with large artic Aneurysm- A middle aged lady with large thoracic aortie aneurysm was posted for Total Thyroidectomy. She was operated at a cardiac centre due to risk of rupture of aneurysm. The surgery was conducted uneventful. 3. Subglottic Web- A 2 &frac12; year old girl came with history of meningoencephalitis when she was intubated and ventilated for prolonged period. Subsequently she developed a web in subglottic region. She had dyspnea with slightest exertion and was admitted two weeks back in stridor at another hospital with conservative management the patient was slightly better and she was referred to Dr. Madan Kapre. CT scan of the child showed that in subglottic region her tracheal diameter was only 2.4 mm. Anesthesing and securing airway was risky due to possibility of airway obstruction and difficulty in introducing even 2.5 endotrachal tube. The child was gradually induced with IV glycopyrnolate, fentanyl, propofol and O2, N2O and sevoflorane. 2.5 mm red rubber uncuffed endotracheal tube with stiletto could be introduced. The risk during LASER vaporization of the web was that sina the tube was uncuffed, there would be free O2 enriched gases in the larynx. As the tracheal lumen was very narrow there was no space for covering the endotracheal tube to prevent LASER punction. To ivercome these difficulties, just before Laserisation the endotracheal tube was disconnected from anaesthesia circuit. During Laserisation the endotracheal tube contained only air, so the risk of tube puncture and airway fire was minimized. The web was successfully vaporized with CO 2 LASER and adequate tracheal lumen achieved. Subsequrently 4 mm endotracheal tube could be introduced easily. The patient made good recovery. 4. Bilateral abduction Palsy in young child – A 7 year old girl came with history of head injury followed y frontal lobe syndrome requiring long term intubation and ventilation.. The child developed bilateral abduction and palsy leading to stridor and had to be tracheostomised. 5. Kashima procedure was done using CO2 LASER. Adequate laryngeal inlet was achieved. On subsequent visit airway assessment will be done and if the laryngeal inlet remains adequate, the tracheostomy tube can be removed. 6. Extensive thyroid malignancy with extranodal spread & nodes stuck to common carotid RLN & esophagus – underwent successful Total Thyroidectomy & Neck Clearance with Complete Clearance. 1. Juvenile Recurrent Laryngeal Paillomatosis- A child with recurrent laryngeal papillomatosis is undergoing treatment with multiple sittings of CO2 LASER vaporization. His larynx is now clear, but there are subglottic pailloma which have to be removed with cold steel instruments through the tracheostome. 2. Botox injection done for spasmodic Dysphonic- Injection of botulinum toxic into the vocal folds was done in two patients of spasmodic dysphonia. This procedure was done under local anaesthesia with EMG guidance and for the other patient was done under general anaesthesia. This procedure was done for the first time in Nagpur. Previously such procedures were only being done in one centre Mumbai and one centre Pune in Maharashtra. 3. CSF Leak Repair- CSF leak in a middle aged lady was repaired endoscopically with fascia lata and surgical glue. 4. Nasopharyngeal Angiofibroma – A young boy presented with Nasopharyngeal Angiofibroma. Patient was operated after embolisation and blood loss was minimal. 1. CSF Leak Repair- CSF leak from cribriform plate was repaired endoscopically in a middle aged lady. The leak was sealed with fascia lata graft and medical glue. 2. Tracheal Stenosis- A young girl had tracheal stenosis post ventilation after suicidal attempt. She had undergone tracheostomy due to the narrow airway. CO2 LASER vaporization of the stenosis was done in 2 sittings. Further endoscopy revealed normal patent airway, so the tracheostomy tube could be removed and patient decannulated successfully. 3. Cochlear Implant Surgery- was performed on a 2 year old child who had profound sensorineural hearing loss. Dr. Harsh performed the surgery under the guidance of Dr. M.V. Kirtane and helped by Dr. Gauri. 2. Rare tumour in Parapharyngeal Space- A middle aged lady had a rare tumor ( lipoepithelioma) in the neck. Major arteries were passing through the tumors hence the surgery was high risk. Patient also had strongly positive stress test so she was operated at Dr. Tambe’s critical care unit. Free Radial Artery Forearm Flap- was done for a patient operated for Ca Buccal Mucosa. Endoscopic CSF leak repair- was done for a middle aged lady patient. 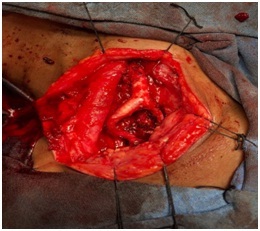 Antero lateral Thigh Flap- was done in a patient after excision of Ca Alveolus.